In many cases, when your customers are having issues with their vehicle, it’s difficult for them to describe or discover the exact problem. Part of the reason is because many problems such as poor engine power, increased fuel consumption and higher emissions can have many causes. Sometimes, a dirty or faulty fuel injector is to blame. Fuel injectors help to achieve the right balance between oxygen and fuel consumption for cars, by changing/adapting the fuel usage in tandem with the oxygen-consumption capacity of vehicles. This ensures that the vehicle’s gasoline is used efficiently. “Check Engine” light is on. Inability to reach high RPMs. Lean misfiring, which feels like the vehicle is jerking. Surging and bucking under different throttle loads. Smoke coming out of the tailpipe. Fuel odors within the vehicle. The cost of new fuel injectors ranges from several hundred dollars for basic vehicles to more than $1,000 for high-end vehicles and performance vehicles that require high fuel-delivery rates. Some garages will remove, disassemble and clean your injectors, but the shop time can quickly add up as well, with most bills totaling more than $500. Instead of forking over that money, owners may want to use a gasoline or diesel fuel-system cleaner to handle the job at home. These cleaners not only can remove existing deposits, but also can help keep them from building up again. This helps eliminate sluggish performance and poor gas mileage. There are a lot of fuel-injector treatments on the market, and while some of them work quite well, others do very little because the dosage is too small or the potency is too weak. When deciding which product to purchase, owners will want to look for one that not only can clean fuel injectors and keep them clean, but also can enhance other aspects of the fuel system that have become dirty due to low-quality fuel, harsh conditions and fuel-quality factors. The best safeguard for vehicle owners is to only use fuel-injector cleaner products with proven track records. Look for products made by companies that have been in business for decades and stand behind their products. This article was sponsored by Rislone. 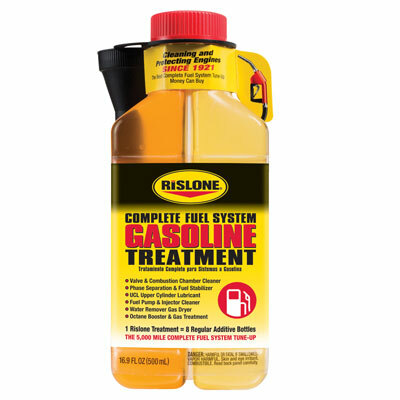 For more information, visit our website at rislone.com.